I was captivated first by a wonderful cover, then by an intriguing epigraph, and then by two stories, at first seeming simple, that twisted and turned together in ways that were wonderfully unexpected. First there was Luke. He was just fifteen when he found himself in the wrong place at wrong time, and was press-ganged into the His Majesty’s Navy. There was no way out, and he found himself sailing away on a warship. He had to learn fast, what was required of him, who he could trust. He was a the beginning of an extraordinary adventure, but he could only think of the girl he had left behind. She Rises is a story of love, adventure, identity and secrets. And all of this in a world that lives and breathes. The houses and the streets of a harbour town. The taverns and the docks. The ships that set sail into the wider world. I liked Luke from the start. It took me a little longer to become involved with Louise. It didn’t help that she was addressing one person – ‘you’ – but soon I realised who ‘you’ was and I understood. That story was effectively told, the prose style distinctive and suiting it perfectly. Like the sea, it had quiet times, but there other time when waves rose and fell, and those moments quite took my breath away. The way in which Luke’s and Louise’s narratives came together was unexpectedly wonderful and, though the change of gear was a little clunky, but it raised the story to greater heights. 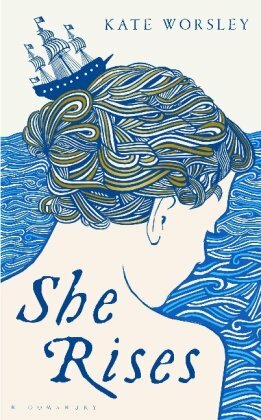 I saw influences, some fine authors and some wonderful books, but She Rises has a spirit, a character, a reason for being that is entirely its own. There were more than enough good things for me to forgive its few failings, keep turning the pages, and feel sorry that now the story is over. This sounds really interesting. I love tales that revolve around harbours and the sea. Will look for it on the library list. Thanks for sharing it. Then this is the book for you, because it does the harbour town and the sea wonderfully well. And I say that from a harbour town! I’ve been tempted by this but not sure if I’m being enthralled by the beautiful cover! The cover is enticing but the book is very readable and I am sure will hold your attention of you decide to give it a chance. I’ve got a copy of this book but haven’t had time to start reading it yet. I was also attracted to it by the striking cover so I’m glad to hear the story is good too! This sounds lovely. I agree about the cover, it’s so eye-catching. I have seen this book but didn’t know much about the story. I really like the sound of it after reading your review.